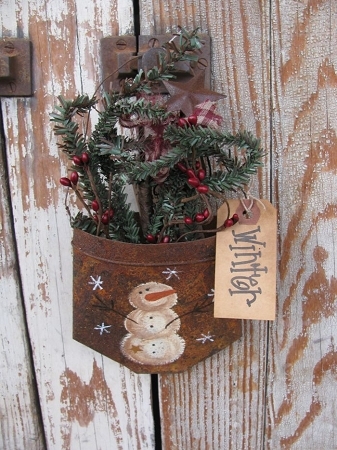 Primitive Winter Snowman Rusty Tin Hanging Pocket. Great seasonal accent for your country/primitive home. I've taken this rusty metal pocket and painted a primitive Snowman on it. I've also filled it with a pine and pip berry pick and added a primitive tea stained tag. You can choose your sayings below for what you'd like on your tag. Size of the pocket is 4.5" tall. Great for peg shelves, cabinet knobs and more. Lots of other seasonal designs painted on the metal pockets, check out our web site. Search Rusty in the search box. Hand painted and designed by Heidi.